The garden is bursting with song, blossom and activity. What a delightful place to be. Our kindergarten is a hive of activity. Please remember to bring hats, it is that time of the year again. Our festival is next week on Thursday 9.00am. We look forward to sharing this special morning with you all. Class One have very much enjoyed the long Russian Fairytale of the ‘Firebird’ over the past week. 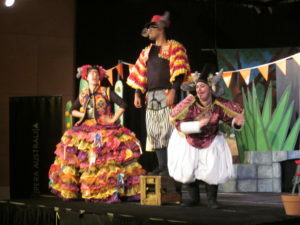 This story has been performed in different places in the world as a Ballet also. So today we have had a chance to use the fiery colours of our crayons and strengthen them with our shading skills to illustrate this amazing golden red magical bird. This is a dream come true for our more choleric and some sanguine temperaments in the class, but a little scary for those with more melancholic and phlegmatic temperaments – yet all the illustrations shine. Thank you to all our Parents for your participation in our Class Meeting this week. Thank you to Rob Jorritsma for kindly giving his time and expertise for a mini workshop, giving us a touch of a Temperaments Experience. The sharing of wisdom, from those parents present, around parenting children at the child’s developmental stage was also very inspiring and supportive – very much appreciated! We hope you can find a little time to join us at the Spring Festival next Friday. 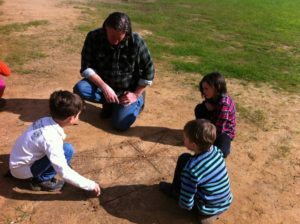 What fun and games we had last Thursday afternoon with our Come and Play date! Thank you to our many parents who came along and shared their favourite games with us and their enthusiasm. Not only did we learn to play elastics, “Kitty in the corner”, but also stilt walking, an indigenous rivers game, more skipping rhymes and a balancing log game. All ‘funtastic’ and taken up in our playground with gusto. A reminder: Please come to our school Spring Festival next Friday with a picnic lunch and join us for more fun and games on the junior oval. We have been continuing with our Weight and Volume Main Lesson and this week we have been very busy exploring the weight of various items around the room using different types of scales. We have learned about how villages in England came up with the measurement of a ‘Stone’ and we were very surprised to see that it all began with grains of wheat, then pennies, ounces, pounds and then the stone!!! We have now moved into the metric system and we have been weighing items in grams and in Kilograms. We also used body mass scales and weighed ourselves. Next week we will explore the measurement of liquid. 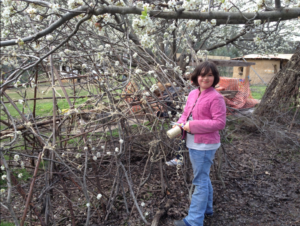 A date has been set for our class Chook House Working Bee. If you are able to come along and help we would love to see you. It is on the first Saturday of the school holidays (Saturday 17th September) at 10.00am. Class Four have been immersed in the stories of lots of different animals as we venture further into the wonders of the Animal Kingdom where there are many secrets to discover. Next week we are off to Werribee Zoo. Please be at school by 8am. Returning at 4pm. 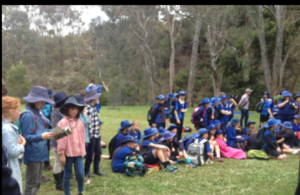 This week we had a wonderful excursion to Vaughn Springs where we joined up with other local schools in a Landcare Day: listening to the sounds of the bush, looking at how plants are growing after the gold digging days, going on a ‘treasure’ hunt to find 21 different birds in the area and looking closely at some macro-invertebrates in the water who can tell us how healthy the water is. Thank you Lisa for organising this day for us. 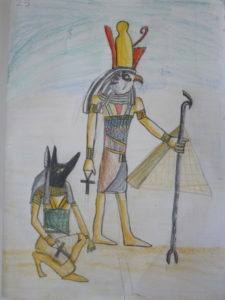 We have had a wonderful journey to the end of term by way of our Egyptian Main Lesson. 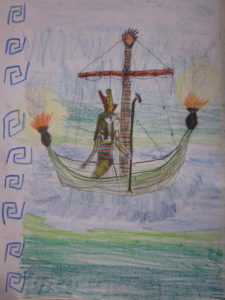 The children continue to be intrigued by the mystery and magic which comes to us out of ancient Egypt – they are engrossed in studying and enjoying the many books in the classroom and are producing some beautiful art-work. We are reading, writing, spelling, using the wonderful stories as a spring board and we have even been working on maths problems using the ancient symbols. 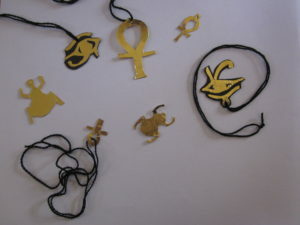 Chris has conjured up an embroidery project for them using Egyptian symbols and the children have made little golden Amulets to wear as good-luck charms as was the ancient custom. Also we have been keeping in mind the coming Greek studies and can be seen often on the oval practising javelin throwing or long-jump, among other things. The class played beautifully in their Ensemble to enhance our recent Open Day. Thank you to all of you who made the effort to come and talk with me about our class and your child’s progress – it was incredibly helpful to me and I know we will all benefit from keeping communication open. 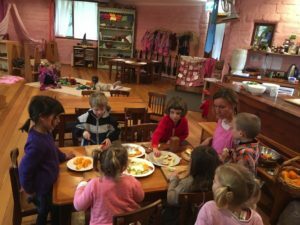 We have a beautiful group of children to share time with and it is great that we all want to make it the best for them that we possibly can. I hope the coming holidays are great fun for you all – the Spring Festival this year sounds like a special way to end the term. Round through the vast Profundity obscure. And said, “Thus far extended thus far thy bounds! Class 6 is deeply engaged in the exploring and discovering the wonders of Geometry of the Circle. 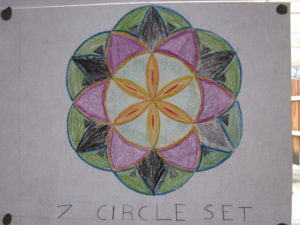 The circle is the most perfect geometrical form. It is the symbol of all the space around us. We find the circle in the sun, which gives us light, in the pupil of our eye, which receives the light, and in the full moon, which causes the tides and rhythms of the earth. 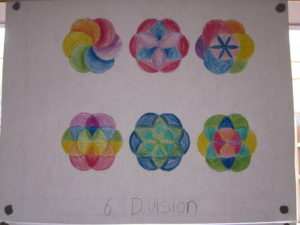 We are quickly covering every available wall space in the classroom with exquisite, artistic, precise geometrical drawings. Where will the next set go?!!! As the end of Term 3 draws near we have the opportunity to review the many accomplishments of the term, for which all students can feel very proud of their achievements. Well done Class 6 students! Anne and Class Seven have been working intently on their ‘Canterbury Tales’ play lately and performances last night and yesterday have been met with wonderful reviews. I am looking forward to attending this afternoon as I am yet to see it. I will take some photos and upload them into the next Penny (Term 4) or Penny Farthing next week! Anne will provide a summary of the play soon also. There will be one last performance tonight at 7.30pm so if you are yet to see the play I urge you to come along tonight. Thank you to all those in the Class 8 community, colleagues and parents who have asked after my well being and sent cards and flowers over the term. It has taken many weeks to form a whole picture of my state of health with the loving help of Robyn and a wide range of medical practitioners up and down the country. My personal Main Lesson currently is, therefore, everything to do with the heart. Thankfully I am making progress – at a snail’s pace, but still progress. So, please accept my heartfelt gratitude for your care and interest. Hi all, as I write this the sun is shining and there is warmth in the air, yay! As we near the end of this term we are also coming to the end of our winter projects. Please enjoy the photos of some of the work completed this term. Knitted dolls in Class 2, crochet in Class 3, viking shields in Class 4, fair-isle knitted beanies in Class 5 and cushions in Class 6. Some children still need to complete these projects and will continue working on them in term 4. 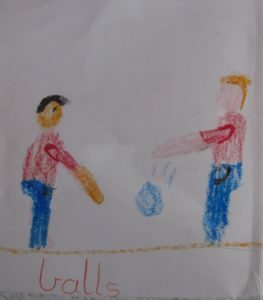 Just coming fresh from Kindergarten and Prep Eurythmy classes… and so delighted to be part of creating the rich experiences children have here! 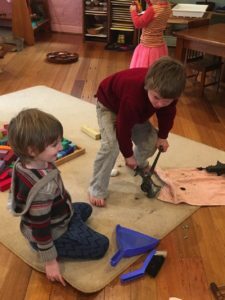 The children, especially at that age, delight to follow along with me through various nature and farming stories, with songs and rhythmic gestures. 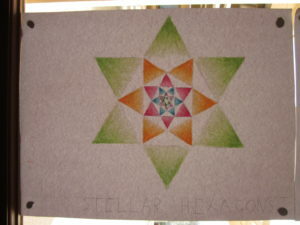 They are generally still connected in such an open and enthusiastic way with the life forces foundational to both their healthy growth and development, and the art of Eurythmy. It is a whole different, but equally wonderful and satisfying work, to bring Eurythmy to the older children also. 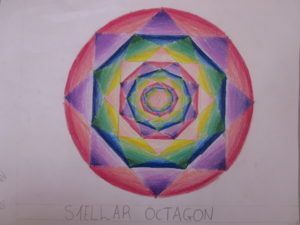 I have been ‘handing over’ the classes more often in the older classes, and am thoroughly impressed with what the students have developed in themselves and as groups able to work together. As Class 7’s cheer “again!” to go through a piece they’ve been working on, the next element can be introduced as the natural progression of its unfolding, and so it goes; learning, growing, together. All the best holiday wishes for all and a lovely end of term ’till then. Class One have added one more song to their repertoire, clapping hands and tapping feet for Si tu es de bonne humeur (If You’re Happy and You Know it). And we hope to soon exchange our lovely song about the snowman for some singing about Spring as the term draws to a close. Class Six used their own words to write the traditional story of L’Aveugle du Pont Neuf (The Blind Man of Pont Neuf) this week – a wonderful French folk tale about the first day of Spring. Class Seven and Eight have been looking at the Main Lesson topic of Food Chemistry through an exploration of French food products and ingredients, with a view to combining some of them in a cookery session later this term. And in addition, Class Eight have translated a set of French language questions based around a visit to the Immigration Museum, which we look forward to including in this week’s City Camp schedule. 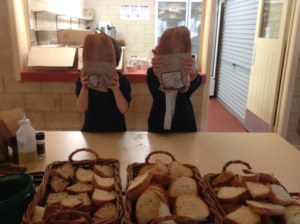 Charlie & Lola cooking at the Buda Harvest Dinner, where they cooked alongside students from all other schools in our Shire, using produce from the garden for 160 guests! Stick huts in the Junior Yard were in need of a little repair and what a lovely day to do it. 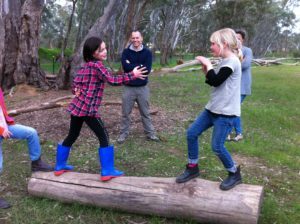 Connecting Country organized a Landcare Day for all schools at Vaughan Springs. Class Four was lucky enough to join with St Mary’s students looking at birds, invertebrates, plants and the soundscape. 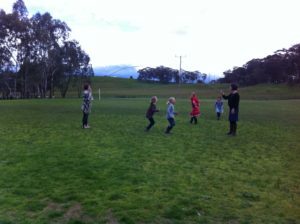 It has been another enjoyable term for the children in the Movement classes this term. We continue to practise our ‘zoorobic’ exercises on the gym mats. Our catching and throwing skills are going well as we practise with bean-bags and balls. All classes have played parachute games, stretching ourselves high to make a huge ‘house’ to shelter in and crawling over or under the billowing waves. To welcome spring the children have all been swirling and twirling their rainbow ribbons to some Irish dance music and the Class Threes are learning some folk dances. Our work will continue next term with the introduction of some new games to enjoy and develop our skills. Enjoy the spring holidays. May you find time for the joy of movement. The Multipurpose Room has been full of fun and excitement lately with all classes taking part in a variety of circus skills, such as juggling, plate and diabolo spinning, hula hooping, uni-cycling and stilt walking . Thanks must be given to Sam Thomas who kindly donated his time and experience, demonstrating some of the wonderful circus skills he has developed over the years. Sam works at Castlemaine Circus and together they were able to provide a variety of equipment to use on the days. They have also been kind enough to lend out their equipment this week and next while we continue practicing our circus skills, leading up to a group or individual performance next week during our P.E. lessons. I can’t wait to see what the children come up with! Thank you Sam and Castlemaine Circus for your support and generosity. Sam talked about the various benefits of circus skills, other than the obvious physical gains. Activities such as juggling allow for self discovery of our own resilience, given the challenging nature of the activity. We find out quickly about our own levels of patience and frustration and our ability to endure through challenges. Circus skills and activities are also generally “you against gravity”, with collaborative support and learning taking place between participants, rather than competitiveness between opponents. With the circus, your only competitor is yourself and your previous personal best! I had hoped to invite parents to our performances next Monday and Tuesday afternoon but many children are a bit anxious about the idea of performing in front of each other so I think it best we don’t overdo it. The afternoon is all about participation and fun; hoping to minimise the pressure for them! Feel free to peer through the MP room windows though! Thanks again for all your support and wonderful feedback. Good times ahead in the yard over the next few months before it gets hot. I love spring at this amazing school! Finally, I hope you all have a wonderful and safe Term 3 holiday break. Looking forward to Spring Festival beforehand though! I see many beautiful things in my work around the school and today I stumbled upon a zen of activity as a dozen or more beautiful smiling faces of the ‘Parents and Friends’ group created felt together. A creation of love and connection, they were making needle cases for the Spring Fair. The Parents and Friends also created the scrumptious homemade fare and alfresco café area for visitors to our Open Day which was so enjoyed that some just stayed on to enjoy the atmosphere. So beautiful, I couldn’t help sharing it! And thank you Sujeeva for help with the chairs! Until next year dear winter. 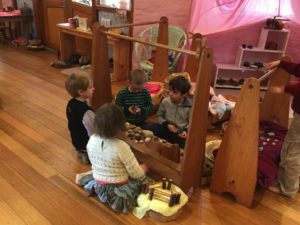 We warmly invite Castlemaine Steiner School families and friends to a joyous celebration of the awakening of Spring at our Spring Festival. 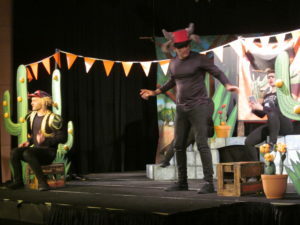 Last Friday the school watched a new performance from Oz Opera – El Kid. Photos below. Raziel Gutierrez will be performing in a concert at our school at the end of this term and would like to invite everyone to attend and enjoy the evening together listening to some music for guitar solo by Mexican composers. The Policy Consultation Feedback Meeting, originally Thursday 8th September, will now be held on Tuesday 13th September at 7.30pm, due to a clash with the Class 7 ‘Canterbury Tales’ play. We apologise for any inconvenience. The school office will be closed in the first week of the Term 3 School Holidays, Monday 19th to Friday 23rd September. School hats must be worn between 1st September and 1st May each year for every play time and on camps and excursions. This complies with State Government Sun Smart program requirements, as a preventative strategy to skin cancer. If hats are lost, the school will provide a replacement and the family will be invoiced again for the replacement. Keys lost between Class 1 and Kinder. Contact the office if found. partner) and have a child at school or study yourself. Last chance to enter as entries close Friday 9th September! Are you planning your next dream trip? Come with me to Spain! A monthly meet up providing a safe space where parents can share common experiences and practical insights. Raziel Gutierrez (current Spanish teacher at our school), will be performing in a concert at our school at the end of this term and would like to invite everyone to attend and enjoy the evening together listening to some music for guitar solo by Mexican composers. 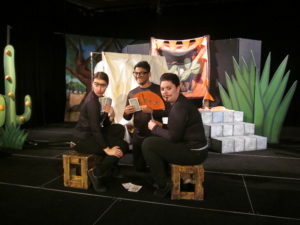 Featuring a stage performance of Alice in Wonderland from the Victorian Youth Theatre, Lego Explorers, and some great workshops and events with the Castlemaine Children’s Literature Festival. 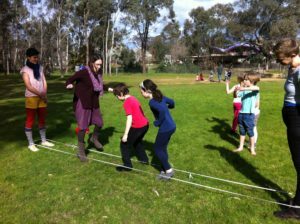 Castlemaine Children’s Literature Festival turns 6! We are celebrating with a mini-festival, A Series of Fortunate Events. Workshops, activities and performances for children aged 2-14 years. First week of the September school holidays. Please visit the website for event information and tickets – booking early is strongly encouraged! 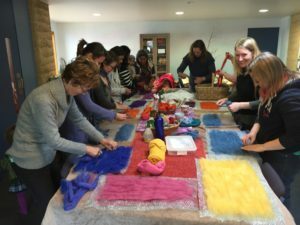 Spend an inspiring day connecting with nature, experimenting with plant materials to create unique patterns and colours on fabric. Connecting with old traditions of hand stitching from many cultures, explore the texture, stitch and subtle colours of slow stitching to create new, old-look textile pieces. 27th – 30th September 2016. For more information contact Vanessa Saunders by text 0407 508 391. $140 for the term. Couples & singles welcome. No experience required. Consulting in Woodend 5th October, 9th Novemer & 7th December, 2016.